The European flag consists of 12 golden stars on a blue background. The stars represent the first union, which was necessary to gather all the countries, and solidarity between member states. In 1850, at the origins of European construction, the flag sought to represent these values. The first imagined refers to European Movement�s flag (green "E" on white), the second to pan European flag. The first is rejected by Robert Bichet, who chairs the commission of the flag, and the second is rejected by Turkey because of the cross designed on it. Many other proposals will suffer this rejection of this religious symbol. New proposals are exposed in Tokyo Palace, Paris. The idea of a large golden star on a blue background is examined, and colours are then selected. Several proposals with these colours are then studied : the Big Dipper on a blue background, or golden rings. None will concur. Asr�ne Heitz proposes a circle of twelve stars on the same background, even making reference to the twelve stars surrounding the crown of the Virgin. The flag is adopted despite of the strong symbol, because the twelve stars also having a symbolic "movement and stability", referring to a clock. Adopted on 9 December 1955, the flag was inaugurated a few days later in the town where he was born, Paris. You can download it in different sizes, in a decidedly modern design for your personal use, or for wider use. Europe's flag is available in 4 different sizes. 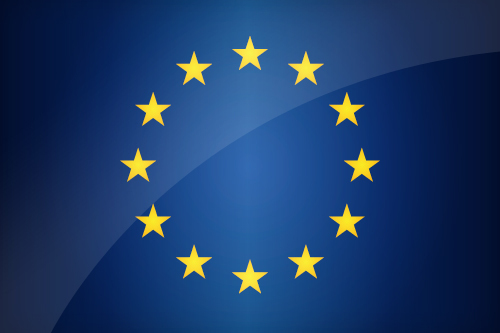 Keywords: Flag europe wallpaper, European, European Union, National european flag, banner, pictogram, country, icon, Europe icon, international, No capital, London, Paris, Madrid, Berlin, Europe. This page has been viewed 10717 times.